July 31, 2014, Santa Rosa, Calif.,—The Sonoma County Winegrowers (SCW) and Sonoma County Vintners (SCV) are excited to announce that the region’s 2014 harvest season got off to an early start on Wednesday, July 30 at 10:15 p.m. with approximately 8 tons of pinot meunier grapes hand-harvested from J Vineyards & Winery’s “Nicole’s Vineyard,” a CSWA certified sustainable vineyard located on Eastside Road in the Russian River Valley. These grapes will be used for the winery’s sparkling wine program. Sparkling wine is often used to celebrate special occasions and major milestones. Ironically, grapes used for sparkling wine, with their lower ripeness levels, are commonly the first grapes harvested, kicking off Sonoma County’s season each year. This year’s start to harvest is one of the earliest on record, but the moderate temperature this past month, with morning fog and afternoon sun, have helped the grapes mature and ripen at an optimal pace. Most winegrowers predict that harvest for still wines, such as Sauvignon Blanc, Chardonnay, Pinot Noir, and Cabernet Sauvignon, will start approximately 1-2 weeks earlier than average, around mid-to late August and end sometime in October. Despite the drought conditions, winegrowers and winemakers are excited by the quality of fruit on vines so far and believe it will be another excellent vintage throughout Sonoma County. The Sonoma County Winegrowers and Sonoma County Vintners will continue to send out periodic updates on harvest. 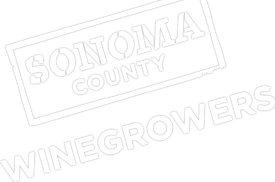 Visit https://wearesonomacounty.com/tag/2014-harvest to stay informed on the latest harvest news. You can also follow along on Twitter and Facebook with the hashtag #SCHarvest14.